She’s going to talk about why crystals do what they do and what makes them so special. 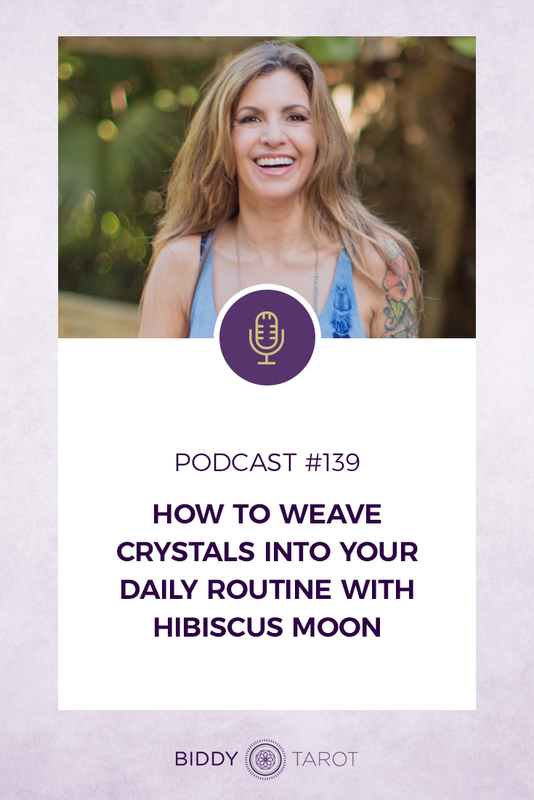 Hibiscus Moon will also tell us how you can integrate crystals into your everyday routine. To learn more about Hibiscus Moon’s Crystal Academy, head over to Hibiscus Moon. Brigit: You’re listening to the Biddy Tarot podcast and this is Episode 139. 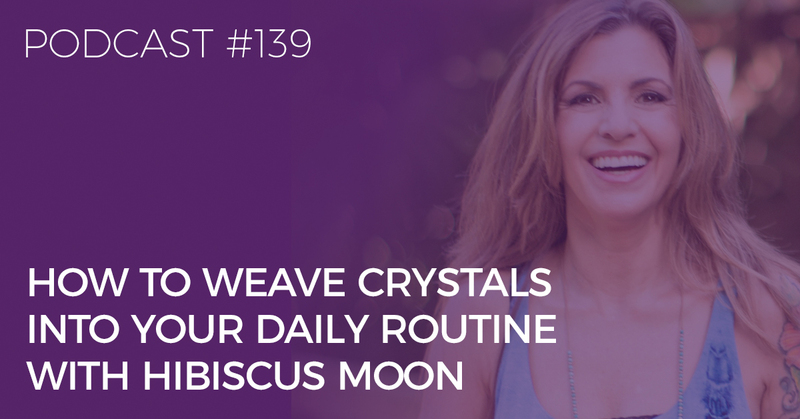 How to weave crystals into your daily routine with Hibiscus Moon. 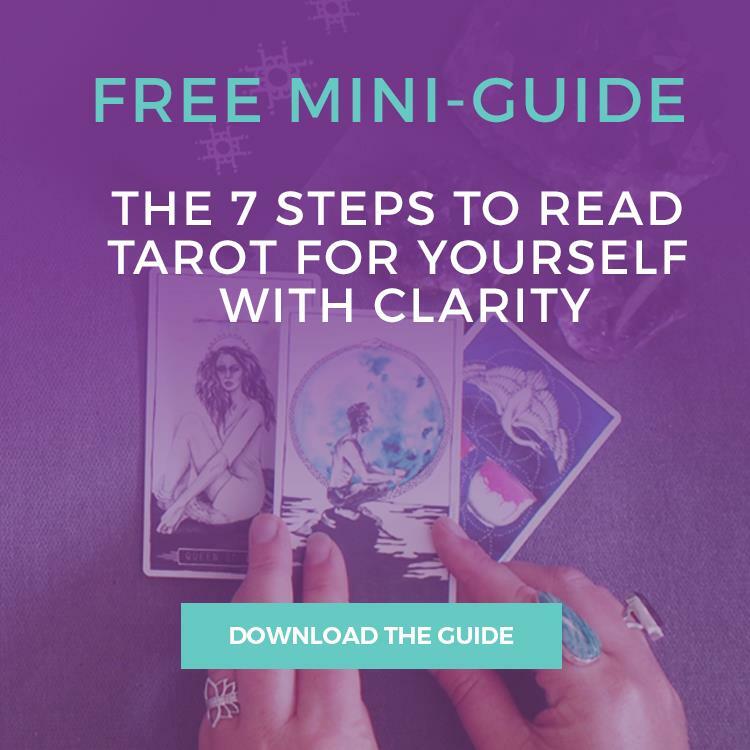 Narrator: Welcome to the Biddy Tarot podcast where you’ll learn how to connect more deeply with your intuition and lead an empowered and enlightened life with the tarot cards as your guide. Listen as Brigit and her guests share the very best tips and strategies to help you read tarot with confidence. Now, here’s your host, Brigit Esselmont. Brigit: Hello and welcome back to the Biddy Tarot podcast. Today I have a really special treat for you and a special guest as always. Today, we’re going to be talking all about crystals. Now, I don’t know about you but I geek out on crystals. I love having them, I’m just looking around my room right now, they are everywhere. I have so many different types of crystals, but if I’m to be really honest, I think they’re absolutely gorgeous, but I don’t know a huge amount about them. I know what they mean, what they do, that they’ve got a special energy about them, but I don’t have a really in-depth knowledge. That’s why I’ve invited my special guest and friend, Hibiscus Moon. Now, Hibiscus Moon is the creator of the Hibiscus Moon Crystal Academy and she is a crystal healer, a self-proclaimed geo-geek extraordinaire. She has an amazing science background, which she then brings into her crystal practice and her crystal teachings as well. She’s also the author of the book, “Crystal Grids: How and Why They Work.” Now, in our conversation today, Hibiscus Moon shares more about why crystals do what they do and what’s special about them, and I found this absolutely fascinating. She also talks about how you can integrate crystals into your everyday routine, which is really neat because Hibiscus Moon is very practical, just like I am, and really likes to use crystals in a way that is not over the top, it’s not convoluted. It’s just easy, simple ways of bringing more of that crystal goodness into your life. Now, also if you are a tarot reader, which I’m assuming you are, I think this episode’s going to be really helpful for you, in seeing how you can integrate crystals and crystal healing in with your tarot practice. Without further ado, let me welcome Hibiscus Moon. Welcome, Hibiscus Moon, it is so good to have you on the Biddy Tarot podcast. How are you doing today? Hibiscus Moon: Great, Brigit. Thank you for having me, I’m really looking forward to this. Brigit: Oh my goodness. This is a long time coming, not only because we’ve had so many years of staying connected and so on, but also I don’t think we’ve talked about crystals yet on the Biddy Tarot podcast and not even on the website, so I’m super excited to be talking about crystals because I have them all around me and you know so much about them, so what a perfect combination, can’t wait. Hibiscus Moon: Yeah, me too. I know you love crystals, so I love how you pull them into the world of tarot and they’re such a natural fit. Brigit: Awesome. For those who might not know you, can you tell us a little bit about yourself and what brought you to where you are right now? Hibiscus Moon: Yes, so I’m a former science educator and science department head and I was teaching physics to gifted students and I did that for about 15 years. I also, in my graduate studies, was always interested in crystals and geology and that sort of thing. My two worlds of loving metaphysics and science collided when I really started exploring crystals on a more metaphysical level. I was looking for other people to connect with. This was back in 2007 and I got on YouTube, because that’s what you do, right? When you’re looking for information and other people to connect with. YouTube was a new thing back then and I found few and far between but there were people talking about crystals in videos and it was like a little community so I really got into it there and just dove in and started exchanging information with people and telling people what I knew coming at it from a scientific point of view and showing off my crystal collection and that kind of thing. Because I was a teacher in quite a large school district … At the time, I think it was the largest or second largest in the United States, I needed to keep my metaphysical pursuits under wraps, and so I didn’t appear on the videos. Just my hands and my crystals, so it was kind of funny looking back at some of those videos, but that’s how it all got started. Brigit: Do you still have those videos on YouTube or have you since taken them down? Hibiscus Moon: No, they’re still there. Because I think they’re so funny to look at. They’re old, they’ve been on there a long time and it’s funny, yeah, it’s quite funny. We all have to start somewhere. Brigit: I know, I always say like Marie Forleo, who has absolutely beautiful videos now and it’s so fun looking back to some of her very first ones. It’s good to see that contrast too because I think you’re creating beautiful videos now as well and people seem to think, “Well, that’s how it’s always been done,” but it’s good to know that, yeah, we do start somewhere and grow from there. That’s neat. Hibiscus Moon: Yeah, it is fun. Brigit: Now, tell me more about crystals. I know you teach week/month-long courses on these so I don’t expect quite that long a response, but I’d love to know this at a really high level, why crystals? What’s so special and magic about them? Hibiscus Moon: Okay, so our entire physical universe is made up of, essentially, pure energy and vibration. In fact, Einstein determined the formula for that. That energy and matter are actually one and the same. That’s the whole E=Mc2 thing. Translated into regular human language, that means that energy equals matter multiplied by the speed of light, but don’t get hung up on that part; it’s just a little mathematical trick. If we were able to see them under a microscope, the molecules are arranged in a highly ordered, repeating, geometric structure or pattern. This highly ordered arrangement is what’s responsible for making crystals so special. That affinity we have for them, that’s what’s at the core of it. Although we love them so much, they’re quite unlike us though. See, our body has a dominant or an average vibratory frequency, which is made up of all the different parts that we’re made up of. Every organ in our body has its own vibratory frequency, so we’re made up of a bunch of different ones and so we have an average, but it’s not very stable. They all get out of whack very easily. This vibratory frequency of ours is quite easily influenced by just about anything in our environment. Our average frequency can get out of whack when we experience, most usually, any kind of stress is going to throw it off. Anything that’s high amplitude, so since we’re connected and influenced by everything, including crystals and stones, our unstable vibratory nature makes it so that just about anything can interact with our energy field and can leave its mark on us. Often we feel that in our emotions. If someone came through and we were in a great mood and someone came through that was in a horrible mood and just a really negative vibe, I’m sure we’ve felt that before. Where all of a sudden now we’re feeling, “Yuck.” Again, since the crystals are so geometrically perfect at their literal core, they have the lowest possible state of disorganization in how they’re structured. We call that the lowest possible state of entropy in physics. They easily maintain their home frequency, unlike us. We call this unique ability that crystals have entrainment. They entrain the energies around them, or influence the energies around them. That’s just the foundation where we can start at. Brigit: I love it. I’m so glad we’re having this conversation because I’ve always thought, “Oh crystals, they’re really pretty and they do stuff,” and now I know why. That’s fantastic. Brigit: Yeah. Each crystal will have a different vibration, right? That’s why it has a different feel or energy to it? Brigit: Let’s say if you had, say, amethyst, that’s one of my favorites. Does that mean every amethyst crystal that you have is the exact same vibration, or does individual crystals have different ones? Hibiscus Moon: It gets a little bit more complicated, however, yes, generally speaking all amethyst have generally the same sort of … Consider them as all part of the same family but they’re not all identical twins. They all have slightly different frequencies dependent upon various things. Their precise hue, their size, their precise shape that they grew in. There’s lots of different variables. Their thickness, all of these things. Yes, size does matter with the crystals. Brigit: Good. I always wondered that, you have those little ones around you, like, “Oh, is this good?” I always want the big ones. Hibiscus Moon: They’re all good, but yes, it makes sense from a physics point of view that the larger crystal is going to have more influence around the environment and the energy that it moves in its environment. Brigit: Yeah, absolutely. Awesome. Bringing it into the every day, how do you integrate crystals into your every day practice? Hibiscus Moon: Oh my goodness. I incorporate them in everywhere. I use them in my morning ritual, my evening ritual. I use that word loosely, I have little routines because I’ve never been one to really dive into elaborate rituals in my life but I have little routines that I engage in and I’m a very practical person. I will only do things on a regular basis consistently if it’s very practical and it fits into my every day routine. I found a way to incorporate crystals in everything that I do. Like I said, my routines in the morning and the evening are the same every day. Crystals are incorporated there. My meditation, my daily hygiene routine, even. Of course I wear them. There’s many other ways to use them and I do use those methods, but as far as my daily life, that’s mainly how I use the crystals. Brigit: Yeah, so tell me, for example, walk me through your morning ritual. I’m really keen to hear. Hibiscus Moon: All right, so let’s see. I will every day wake up with a glass of water next to me that has a crystal plopped inside of it. If you want to get a little more detailed into that, we can dive into that but I’ll just move on with my routine a little bit. Then I have my crystal, it’s a rose quartz that I’ve been working with for years and years, I call it my crystal buddy. I pull it over onto my lap and I start doing my routine of going through my affirmations, my intentions for the day, setting the intention for the day, writing through my crystal journal. It’s like a little bit of a mentor that I keep by my side to help remind me of the intentions that I want to bring. It even helps me to write and think through certain things. Then I’ll go through … Well, I’ll skip the hygiene because that gets a little bit crazy, but I pretty much plop crystals into every lotion and potion that I use. They’re in all of that stuff. Even the water system in my house has crystals in it, so I literally have gem elixir on tap. Then I go into my meditation and I bring my crystals there. I always have a crystal that I’m working with at my altar, depending on what I would like to focus my meditation on, but I usually use the same crystal for a month for those meditations until I decide that I want to start using it in a different way. Then I always have a crystal grid set up; that’s part of my morning routine as well, is sending a little TLC, I like to call it, to my crystal grid. Just some attention to whatever it is that I’m working on manifesting. That’s just a quick run-through my morning routine. Brigit: Yeah, fabulous. I love it. My brain just naturally starts thinking how Tarot aligns with that, and I guess it would almost be like drawing a daily Tarot card and then journaling with that but for you, you’ve got this daily crystal and it’s a crystal that will continue with you for a period of time but nonetheless it’s the focus of your intention of your meditation practice and so on. It’s very similar to how you read Tarot, it’s neat. Tell me more about crystals in water. I’m curious, how does this work? Hibiscus Moon: Okay, so you can get definitely more ceremonial with it, but I just like to take a crystal and make it easy and plop it into my water. I know people can’t see it right now, but I have a large rose quartz point in my water bottle right now, but what I often recommend and for people that are just starting out … First of all, water is highly programmable and very easily integrates with the energies of the crystals. They infuse their energies into the water quite easily. Water is a very good conductor of energy, so these two things, crystals and water, go hand-in-hand together. I like to drink water that’s been infused with crystals. There are some cautions to be mindful of, so let’s just keep it safe and easy. I would say stick to tumbled stones. The reason I say that is because if it’s a rough stone and it’s not tumbled, it’s not smooth, it can easily break off a shard or a little splinter or something, so we don’t want that. Another thing you want to be mindful of is you want to be mindful of the elemental content in crystals. We can’t just throw any old crystal in water and drink it because some actually have things that are harmful in them, certain things that you don’t want to be drinking, like mercury, lead, antimony and things like that. To make it easy, so that you don’t have to go looking up the chemistry on a crystal and finding out the most hardness and all these geology terms and things, stick to tumbled. Tumbled stones, for me, they’re the calcite family or the quartz family. Both of those have a wide range of colors to choose from, they’re easily available, they’re quite affordable because they’re so abundant on our planet, so literally have the range of the colors of the rainbow to pick from. If you want to work with a particular chakra or a particular type of energy, you’ve got any color to choose from, either the calcite or the quartz family. Like I said, they’re easy to find. Say you want to balance the throat chakra, you can choose a blue lace agate, which is a type of quartz, and just plop it into a glass of water. Some people like to set it out in the midday sun for a few hours because that does potentize the water but you can let it sit there overnight if you like. I just plop them in in the morning and just drink it throughout the day. Like I said, I usually don’t get very ceremonial about things. You certainly can. If you’re totally new to this and you’re like, “I don’t even know what a blue lace agate is, I don’t even know where to begin,” you could ask someone at a crystal store or just take a clear quartz tumbled stone and plop that into your water. You can do your own experiment with this. Plop it into a glass of water, maybe let it sit there for an hour, even put it in the sun for an hour. Have a control, have another glass of water with nothing in it and just test or experiment the two. Compare the two side-by-side and taste the water and you’re going to notice an extraordinary difference in taste and texture in the water that has the clear quartz in it. It’s amazing and it’s just fun to see these things or taste this for yourself. Brigit: I love it. I’m so excited, I can’t wait to go and drink some water now with the quartz in it. That’s fabulous. I guess this is a bit of a practical question: Is it okay to wash your crystal before you put it in the water? Because let’s say you’ve bought it and, obviously, lots of people may have handled it, how do you make sure it’s clean before you start drinking the water? Hibiscus Moon: Yeah, I should’ve mentioned that. Yes, you do want to wash it, that’s a good idea, is technically, physically cleanse it under some soap and water is always a good idea because some of these miners’ fingers, have you seen their fingernails? They’re pretty dirty. You do want to do that and they’re coming out to begin with. Brigit: Yeah, okay, that’s good. Fabulous. Tell me some other, I guess, every day rituals. Every day things that you can do with the crystals and where you don’t necessarily have to be over-the-top with ceremony, as you were saying. It’s more like easy, practical uses. Hibiscus Moon: Right, well, something we’ve been doing for thousands of years, maybe even longer, is wearing crystals as jewellery. Recently we found a jade bracelet or anklet of some sort that a proto-human was wearing, so before we were even human we’ve been doing this. Wearing the crystals, it’s very easy. First of all, they’re beautiful to look at, you can match them to your outfit, but really the reason for doing this, why we ever even started doing this, was to have the crystals influence our energy field. Like we said before, they’re entraining the energies around them and because we’re so easily influenced because of the reasons we talked about earlier, it makes it really practical and easy to just simply wear the crystals. Some people say, “I don’t have a pendant,” so they just stick them in their pockets or they stick them in their bra or they put them in a little pouch and carry them around with them. You can do it that way too, but you’re essentially just … Like I said, we’ve been doing this for thousands of years and the reason why is that it works. We do notice this influence happening, the entrainment happening from the crystals. Brigit: Yeah, so I was wearing it as a ring and I wore it just because it was purple, I like purple. Brigit: I sat down for a reading with someone, like a psychic reading, and she’s like, “Oh, you don’t need this stone anymore. It’s not serving you anymore. It’s not required by you.” I’m really curious on your take. Could we ever be wearing a crystal to the point that we actually no longer need it and it needs to be refreshed or anything like that? How does that work? Well, that’s because the crystal was done working with you and it’s ready to go work with somebody else. Then there was something else that you brought up and now I lost my train of thought. There was another aspect to what you had mentioned there about working with the crystals and I lost my train of thought. I don’t know where I was going with that. Hibiscus Moon: That was … Okay, thank you for jogging my memory there with that. Okay, so yes, we definitely can use crystals so much that they literally need a break, a vacation, just like us. It can happen to us, right? There’s actual physics experiments done, I don’t remember the name of the gentleman. It’s mentioned in the book “The Secret Lives of Plants” where they were testing different metals and they had noticed that the metal after being used after a certain amount of time, and metals are minerals, crystals are minerals. They’re all part of the same family. They realized that just like a, quote-unquote, “living” organism, the metals, after a lot of use, started getting very tired and they had to actually do things like massage the metal or put it in a warm water bath to get it to reconstitute its energy. Is that not the funniest thing you’ve ever heard? Really, a massage and a bath? Now, who else do you know that could use one of those to get their energy back up and running again? The metals are in the same family as the crystals and the stones, so quite literally, a crystal or stone can lose its affectiveness if we’re overusing it too much. I feel like what we need to do at that point is what I call retune the mineral and what that basically is … Just like if you overplay a guitar, you play it and play it, the strings start getting a little wonky and you need to retune the guitar to get it back to sounding correct again. You need to give it some attention, some TLC. Same with the crystals, there’s different ways and I teach about that, to retune the crystals, or just simply giving them a break and letting them rest for a while also can allow them to recharge their energy again. Brigit: Again, it’s very similar with Tarot, I think, is the point at which with your Tarot deck, the energy that have been overused or even sometimes negative energy has got into there. Maybe you’ve been working with some really tough clients, difficult clients, and that starts to get infused and you can just know when your deck feels like … It’s not quite right. I assume it’s very similar with crystals and we haven’t even touched on when there might be bad energy infused into a crystal. Is that even possible? Hibiscus Moon: That makes a lot of sense, what you just said, about the Tarot deck and I think it’s like that with anything. Yeah, it’s possible for bad energy, it’s not as easy because crystals don’t hold energy so much as get tired. Because of the nature of their molecular makeup, I believe that that’s the reason for that, but it does happen. I’ve heard of it happening, so I think a good re-tuning is just good for a number of different things. Brigit: To be clear, I do not mean that a crystal can get cursed, in case anyone’s thinking of that. Just like with Tarot cards and they have a curse, they don’t make bad things happen, but just sometimes it can be like … Yeah, negative vibes or just a bit of an icky feeling, but it’s good to hear. With crystals, it’s almost as if … Well, they are your rock, right? They’re this solid foundation that really doesn’t change as much as we change, as you were saying at the start. We can be very much in flow and up and down and so on, but crystals are your rock, excuse the pun. Hibiscus Moon: No, true. It’s very true. 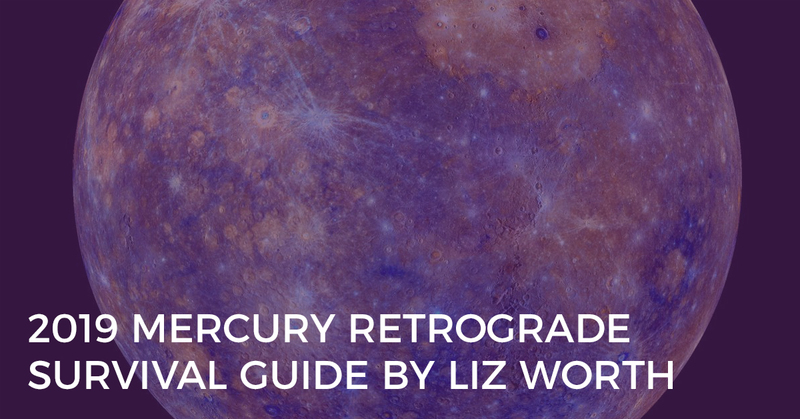 Brigit: Yeah, so if you were just getting started with crystals, what would you recommend for someone who wanted to dabble and start using crystals in an every day way? Hibiscus Moon: I would say definitely start with the drinking water and the gem elixir. Like I said before, clear quartz is a good beginner crystal all around, whether you want to put it into your drinking water or you want to start meditating with it. That’s an easy way to start using the crystal and you can just see. Is your meditation easier when you’re using the clear quartz? Clear quartz is known for being good for any intention and bringing clarity into your life as well as it’s good for amplifying other crystals too. It’s just a good crystal to start off with. You might notice that you’re getting messages when you have your clear quartz nearby, you’re maybe remembering your dreams better than you were before or interpreting messages better in your dreams better than you were before. Then, like I said before, I always love to try experiments. Put a crystal in the water and the other water without the crystal and try that. Also, clear quartz is great for helping your plants to grow. I’ve done an experiment like that on my YouTube channel where I had four different plants and we did different variables and different ones. Watered some with gem elixir, some with crystals actually planted in the dirt, and the plant that was both watered with the gem elixir and had clear quartz planted in the dirt, everything else was the same. No other variables there, just that, it grew just so vibrantly, so amazing. I was so happy that I caught it on video because everything else was the same. There was nothing else to account for. It was as if the plant was just so in love with life and just infused with this vital energy force from the crystals. It was amazing, so start with a clear quartz crystal and just use it in a couple different ways there and you’ll get hooked. You will definitely get hooked. Yeah. Brigit: I can tell you, I’m hooked. I’ve got to keep myself off Etsy so I don’t keep buying more crystal jewellery. Hibiscus Moon: Me too, I know. Brigit: Terrible. Now, you also run the Crystal Academy and you have a certification process in there plus a really in-depth training process. Tell me a little bit more about that and why were you inspired to create an academy for crystal lovers? Hibiscus Moon: Okay, so I actually can’t take credit for it. My community, our tribe, actually demanded that I create it. 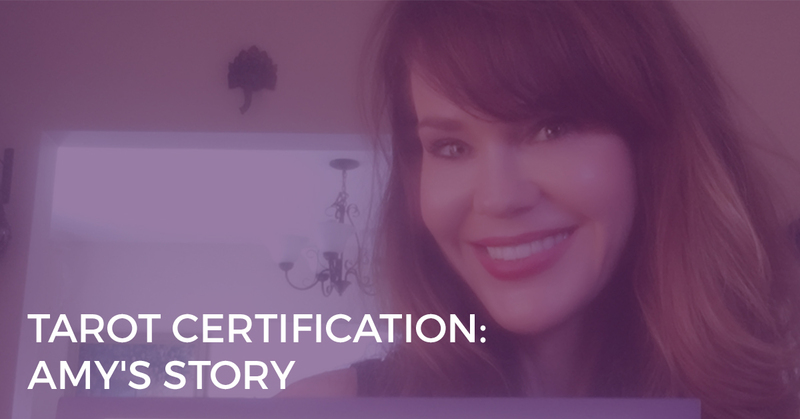 We’re an accredited virtual online academy now and we certify people in the art and science of crystal healing, and it’s funny because it grew from that YouTube channel that I started many moons ago and I started teaching about crystal grids on there. Not really so much teaching, just sharing my ideas and people started asking me all kinds of questions because I had this scientific bent to what I was doing. Of course, I don’t do everything that everybody asks me to do. If it resonates with me and it sounds like fun, and it did, I said yes. Our tribe actually demanded it and it was born, the Hibiscus Moon Crystal Academy in 2010. Now we have over 1,500 certified crystal healers that have successfully graduated from our academy in over 35 countries around the world. I couldn’t be more proud or grateful for how this has all unfolded. Brigit: That is so awesome. I love it, and I love that you’re having such a big impact on the world in a really positive way. It’s neat. Say those folks who are getting certified, what do they do with their new knowledge and skills? Are they mostly going on to do crystal healing work or is it for personal use? How does it play out? Hibiscus Moon: It’s funny because I think most of the people come into the program just curious, wanting confidence around their beliefs and for personal use. However, they go through the program and I’d say about … At least 75% of our graduates decide that, “Okay, I want to make this my career, this is what I want to do for a living. I’m going to make a career change,” big changes, huge transformations happening all over the place. I see this all the time and they start working with clients and earning a beautiful income doing something that they love and they feel really confident about. Brigit: Yeah, I don’t know if any particular students come to mind who have been able to take that and then create business or a whole new lifestyle for themselves. Hibiscus Moon: Yeah, absolutely. Because I run into them all the time now. In this world, it’s a small world but I run into them. They go in lots of different directions: They don’t all work with clients but some do, some now work with me, but I’d say a majority of people work with clients one-on-one. A lot of them do client work with distance healing, because that’s possible with crystals as well. Some people choose to take the retail path and they have these huge Etsy shops, maybe one of the ones you were talking about earlier, and they’re selling crystals on Etsy or on eBay. They’ve got so many creative endeavors. Lots of different healing tools, like sage smudge fans with crystals and rattles and jewellery. I have one of our students, Jess K., who makes jewellery and she’s created her own oracle deck influenced by crystals and she does private crystal readings. She’s just got a wide array of all kinds of beautiful things. They just go in all these different directions and I’m so amazed. We even have one who was an interior designer and has worked crystals into her high-end interior design business. Just amazing things. Massage therapists who have brought crystals into their therapy, into their practice. Just so many beautiful things unfolding. Brigit: To be able to integrate them into so many different aspects as well. Brigit: I’m thinking it’s a bit like Tarot. 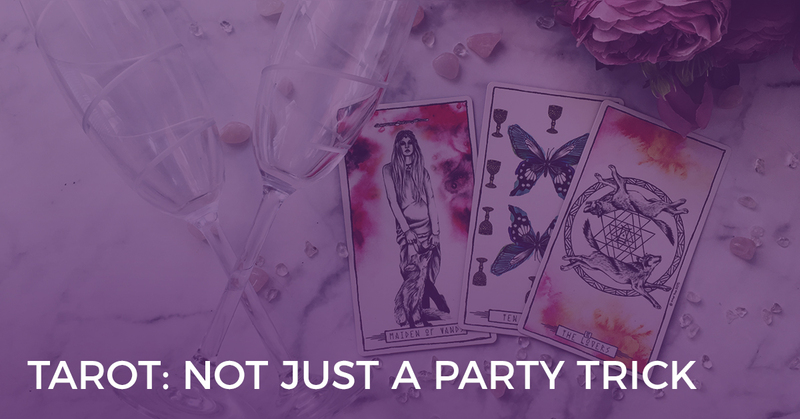 When I say you can create a business with Tarot, a lot of general public people will be like, “Oh, how does that even work?” and say the same is with crystal. You think, “Well, how would a passion for crystals turn into something that could be a thriving business?” Not only just a thriving business, a passion-based business, which is great. Hibiscus Moon: Yeah, that’s what I hear all the time, is people say, “I’m stuck all day in my cell, I mean cubicle. I’m doing this job and I can’t stand it, all I can think of is coming home and doing my crystal studies. I want this to be my job, I want this to be my career now.” This hadn’t entered their paradigm earlier, before they take the course and before they dive into this world. Then they’re surrounded by this community and everybody’s so passionate and talking about it and they’re seeing all these amazing things, and like you said, they’ve gone into so many different beautiful creative directions that I had never even thought of. I learned so much from them. Brigit: You’re only opening up the doors to your academy twice a year, right? Hibiscus Moon: Right. We do that and, yeah, we’re coming right up on it. It’s not open all the time, yes. We close the doors just like a real school. Brigit: Yeah, beautiful. For folks who might want to find out a little bit more about it, they can go through to BiddyTarot.com/Crystals and I believe if you’re listening to this podcast right as we release it, I think we’re just before your academy opens so there is a wait list, is that right? Hibiscus Moon: Yes. They’re going to want to get on the wait list. Open registration will be happening very soon, but if you’re on the wait list you get some very special perks that you will be sorry to have missed out on, so definitely get on the wait list because it’s well worth it. Brigit: Awesome. We are supporting you 100% of the way. To check it out, go to BiddyTarot.com/Crystals and that way you can find out more about the academy as well. Hibiscus, what’s next for you in the world of crystals and doing awesome things, what’s coming up for you? Hibiscus Moon: Well, I’m really excited right now because I’ve been creatively diving into new curriculum for myself. I’m working on a series of electives for the academy that I’m offering to people, no matter where they are on their crystal journey, and of course I’m always excited to welcome our latest crop of new students. That always gets me excited in the new term because I get that whole back to school energy rush that I’m used to as a teacher. That’s the way it’s been for me for years, so I built it so it still remains that way. Back to school adrenaline rush. Brigit: Yeah, beautiful. Then where do you think the world of crystals in general is going? What do you think is the next evolution over the next five to 10 years? Hibiscus Moon: Well, it will be interesting to see because something unexpected happened. In case you haven’t noticed, this year, 2018, is the year of crystals and it’s a trending topic for this year so they’re everywhere. I keep saying it’s going to be really interesting to see how this plays out. Will it be like other fads and go out of fashion or … I think it’s really great that this has happened because it’s opened up the world of crystals to the mainstream and introduced it to the mainstream. Everybody’s into crystals. The celebrities are all talking about it. People are writing books about crystals that never … It never entered their world and I think it’s wonderful because it’s letting people into a whole other world that they never realized existed. They’re attracted to them because of their beauty but now they’re getting led into the deep end of the pool of metaphysics. Before they know it, they’re interested in all these scientific and spiritual topics and blending the two together, seeing where they dovetail together. I feel like that’s the magic spot right there. I’m so excited that people are now open to it that might’ve been closed off to it before. Brigit: Yeah, fabulous. I’ve always envisioned this kind of universal setup where there are so many doors, almost as if it’s this big, round circle filled with all these little doors, and these doors are going into a place of complete, universal wisdom, inner wisdom, intuition and so on. These doors are things like crystals, like Tarot, like astrology, numerology, energy healing, Reiki, massage, whatever it might be, meditation. Whilst these doors are different, they’re all leading to the same thing and they’re all leading to the same place and it’s beautiful that we have this choice to choose the door that feels right for us. We can go through multiple doors. I know many of our listeners will already be combining Tarot and crystals and ultimately it’s taking us to the same place. That place where we can trust ourselves and our intuition, we’re connected to our inner wisdom, we’re connected to universal wisdom. Yeah, it’s such a powerful and exciting time, I think. Hibiscus Moon: I love that analogy. I like how you put that, Brigit. That’s a beautiful way to put it, I like that a lot. It’s like, basically, visualizing the quote of there’s many paths up to the top of the mountain. I love that. Brigit: Yeah, neat. Hibiscus, where can people find out more about you? Hibiscus Moon: Well, if they want to come on over to HibiscusMoonGift.com, you can find out more about me. You can get started into the world of crystals. I have a free gift there where it’s all about creating sacred space with crystals, I created an entire e-kit there. Includes an e-book, a private tour of my own sacred space and crystals along with a relaxing meditation MP3. It’s HibiscusMoonGift.com. Brigit: Awesome. I think that’ll be great particularly for those who are reading Tarot, I often talk about the need to create that sacred space before a reading because sometimes we can just rush into a reading and go, “Oh, there’s the card, okay, that meant that. Carry on.” If we are creating that sacred space, we get a lot more out of a reading, so having that integrated with the crystals would be fabulous, so definitely check it out. That sounds really awesome. Is there anything else you wanted to share so that this conversation feels complete for you? Hibiscus Moon: Just that I feel that crystals and Tarot are such a natural pairing, they go so well hand-in-hand and I know many of our students who are interested in crystals are also attracted to the Tarot, so I know that it’s just a natural fit. The two of those together, and I’m so glad we got together to speak about both of these topics to really bring it all together with a big red bow on top. Brigit: Yes, it’s well overdue but I’m glad it’s happened. Brigit: Awesome. Well, thank you so much, Hibiscus Moon. It’s been an absolute joy, I loved learning about all the crystals. I’m sure our listeners are going to be getting on Etsy really soon and also make sure you check out Hibiscus Moon’s Crystal Academy, it is amazing. Thank you so much. Hibiscus Moon: Thank you for having me, it’s been a total joy. Brigit: There you have it, I hope you enjoyed the conversation with Hibiscus Moon and I. Now, remember the Crystal Academy is opening up very soon. It only opens up twice a year and this program will give you such a solid foundation when it comes to understanding crystals and how to use crystals in your daily practice and also as Tarot readers, how you can start to now integrate it in with your Tarot reading practice. I don’t know if you’re like me, but again, you might have a lot of crystals around but you don’t necessarily know the ins and outs of what those crystals do or how you could use them even more so in your tarot practice, so I highly recommend Hibiscus Moon’s Crystal Academy. You can find out more by going to BiddyTarot.com/Crystals, and if you’re listening to this podcast as it’s released you’ll probably find that the academy is on wait list. Make sure you sign up for that wait list because as Hibiscus mentioned you’ll get a very special deal if you’re on that wait list. Please check it out, I think you’re going to absolutely love the program and there are just so many possibilities with what you can do with this newfound knowledge and skill. Now, next week I will be coming back to the podcast and we’ll be talking about how you can really tap into your soul’s purpose using Tarot as a guide. This is an extra juicy episode, I think you’re going to love it. Make sure you have your pen and paper because we get into some really beautiful, practical activities that you can do. All right, have a great week and we’ll speak soon. Bye for now.